Trinity Christian (GA) School senior Jacob McLeod has signed with Belmont University in Nashville, Tennessee. The senior ranks 17th in our Flo50 rankings. He has run PRs of 4:14.77 for 1600m, 9:06.19 for 3200m, and 14:50.22 for 5K at the Wingfoot XC Classic this fall. McLeod took visits to North Carolina, Furman, Florida State, and Belmont. Ultimately, he said the future of the Belmont program is what excites him most. "I decided to go to Belmont because I see a lot of potential with the team," he said. "I had the option to go to some bigger programs, but I really liked the idea of trying to establish Belmont as a big-time distance program." McLeod is following in the footsteps of his brother, Kaleb McLeod, who just recently placed 21st for the Bruins, earning all-region honors at the NCAA South Regional Championships. "I really enjoyed being around the team as well as my brother, and I feel that we would all benefit greatly from racing and training together," he said. "The team has huge potential and is going unnoticed right now just because they aren't a big name. They have had a few bumps in the road this year but next year they are about to make a huge jump." For McLeod, part of the draw to the Belmont squad was this season's redshirts. He feels they'll be great training partners next year. "They redshirted both of the Vroon twins that were a valuable part of last year's Brentwood NXN team," he said. "I feel that we can surprise a lot of people and really rise to be a nationally recognized team. Every big-time distance program has to start somewhere and I feel that we are just beginning." For some, Belmont might have been a surprise pick for a national talent like McLeod, but he saw it as the perfect fit. "I know that people will be surprised at my choice just because I'm probably the only one on the Flo 50 rankings that hasn't chosen a huge program, but those people do not see the true potential in this team," he said. "I feel that we will have a huge shot of making the NCAA national meet next year if things go to plan. After that, the sky is the limit with what we can achieve together." Before then, McLeod has big goals to finish out his senior cross country season. 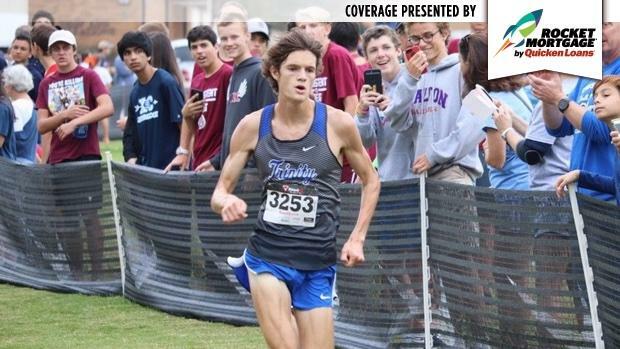 Last year he ran at the Foot Locker South Regional, where he placed eighth and qualified for Foot Locker Nationals. At the national meet, he finished 15th. In the coming weeks, his goals are bigger despite breaking his jaw a few weeks ago on a training run. "I will have my jaw wired until Wednesday next week, but I don't think it will affect my training much," he said. "I still plan on running Foot Locker and I'm going to try to go for the win at regionals. I think I have a shot at nationals as well." He says he ran last weekend with his jaw broken at the 2017 USATF Georgia HS Cross Country Meet of Champions, only feeling a little nauseous. "I ended up walking away from the race with a solid time and still feeling like I have a lot left in the tank. I'm pretty determined not to let my jaw affect my races at Footlocker," he said.